In lieu of flowers memorial donations may be made to Herriman Chapel Church and left at the funeral home. 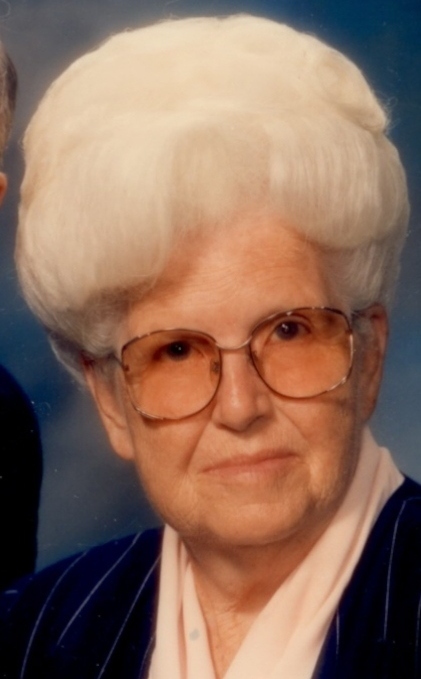 Lorene Bland Witt, age 88, went to be with the Lord on Saturday morning, November 26, 2011, while in the Cedar County Hospital in El Dorado Springs, MO. She was born near Cedar Springs, MO, to John Daniel and Blanche Rena (Bourland) Bland on September 30, 1923. She was raised in the Cedar Springs, Black Jack and El Dorado Springs areas. After graduating from El Dorado Springs High School in 1942, she lived briefly in Kansas City. Miss Bland was contacted to see if see would return to her home area to substitute teach and complete the school year for ailing Uncle Lon Witt at the Black Jack School. She agreed and it was during this time that she renewed the acquaintance of Mr. Witt, the local proprietor of the Witt Store in Black Jack. On August 11, 1943, she was married to Aubra D. Witt. To this union three children were born. Waiting to welcome her to the other side were her parents; husband; two sons: Gary Wayne and Glen Ray; a granddaughter, Melinda Gayle Witt; three sisters: Opal Rosenbaum, Darlene Garrigus, and Fern Vilhauer. Left to cherish memories of Lorene are: one daughter, Patricia Gayle Moomaw and husband Don of El Dorado Springs, MO; one grandson, Jason Moomaw and wife Melinda of El Dorado Springs, MO; five granddaughters: Kimberly Leonard of Shawnee Mission, KS; Stephanie Woods and husband Brent of Fulton, MO; Jennifer Carpenter and husband David of Overland Park, KS; Crystal Pridey and husband Curtis of Ft. Scott, KS; and Christy Moomaw of El Dorado Springs, MO; twelve great-grandchildren: Peyton, Jaydon, and Parker Leonard; Gabriel, Mason, Emma and Dean Carpenter; Zachary and Myranda Pridey; Harold and Nikita Woods; and Ireland Moomaw; two daughters-in-law: Loretta Witt and Sharron Poe; and her extended family and traveling buddies: Lester and Lee Etta Witt of El Dorado Springs, Lorraine Sands of Lockwood, and Dorothy Witt of Kansas City. She is also survived by a brother-in-law, Norman Vilhauer of El Dorado Springs. Lorene’s life centered around God and family. After surviving the dreaded disease of diphtheria as a child, she knew that there was a God of miracles. As a young woman she dedicated her life to the Lord and attended church faithfully throughout her life while health permitted. She fulfilled different roles as were needed: Song leader, Sunday School teacher, Sec. and Treas. of church and Sunday School, and took care of custodial duties. She recently stated to her daughter, “If you live each day for the Lord, you won’t have to worry about death.” She also stated, “It is better to laugh than to cry.” Throughout times of great loss, she role modeled courage, strength, a sense of humor, and a faith in God that never wavered. She was a devoted wife and mother and took great pleasure in her grandchildren and great-grandchildren. She was a talented cook, seamstress and homemaker and many were blessed by her gift of hospitality. Her ability to prepare large and scrumptious meals was appreciated by family and friends. She loved to follow politics and current events and enjoyed a spirited debate. She was a charter member of the Cedar County Federation of Republican Women’s Club and for a few years served as Chaplain. She encouraged others to join and be involved in electing conservative officials at all levels of government. She also served as a Republican Committee Woman for many years. She represented the Republican Party as Election Judge for close to thirty years. In a special ceremony in Jefferson City, on August 4, 2001, she was recognized as a Woman of Tribute by the Federation of Republican Women’s Club. Lorene retired from Witt Printing Company in 1987. She loved her work and stayed in touch with her co-workers while health permitted. After retirement she joined and volunteered many hours to the Cedar County Memorial Hospital Ladies Auxiliary. Her and her husband, and extended family and friends took many vacations from “sea to shining sea”, and throughout the Continental North America, and a special trip to the Virgin Islands. As we remember this woman and celebrate her promotion to Glory, let us remember what she has left us: A priceless legacy, a path to follow, and a place to arrive, where all is well forever. She will be sadly missed by her family, but who are awaiting that day when there will be a great reunion with no more parting and no more tears. The family will receive friends at Bland-Hackleman Funeral Home on Wednesday, November 30, 2011, from 6-7 p.m. Funeral services will be held on Thursday, December 1, 2011, at 2:00 p.m. at the El Dorado Springs Church of God (Holiness) with Rev. David Woods and Rev. Brent Bland officiating. David Carpenter, Ben Nelson, and Vera Bourland will provide music. Interment will follow in Love Cemetery under the direction of Bland-Hackleman Funeral Home. Pallbearers are Neil Sands, Lonnie Witt, Stan Vilhauer, Curtis Pridey, Brent Woods, and Jason Moomaw. Honorary pallbearers are Don Moomaw, David Carpenter, Zach Pridey, Harold Woods, Gabe Carpenter, and Payton Leonard.